It’s been awhile since I posted a dessert recipe, so this seemed a good time. 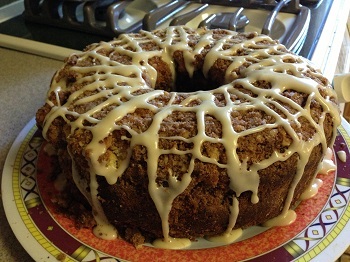 Who doesn’t love a sour cream coffee cake? I found this recipe online, but it’s originally from Barefoot Contessa Parties. *If you don’t have cake flour, you can either use all-purpose flour but use 5 Tbs. less, or you can take out 5 Tbs. of the all-purpose flour and replace it with 5 tbs. of cornstarch. Sift the two flours together before measuring. Preheat oven to 350 degrees. Grease and flour a 10-inch tube pan. Cream the butter and sugar in the bowl of an electric mixer fitted with the paddle attachment for 4 to 5 minutes until light. Add the eggs one at a time, then add the vanilla and sour cream. In a separate bowl, sift together the flour, baking powder, baking soda and salt. With the mixer on low, add the flour mixture to the batter until just combined. Finish stirring with a spatula to be sure the batter is completely mixed. Make the streusel: Place the brown sugar, flour, cinnamon, salt and butter in a bowl and pinch it together with your fingers until it forms a crumble. Mix in the walnuts if you use them. Spoon half the batter into the pan and spread it out with a knife. Sprinkle with ¾ cup of the streusel. Spoon the rest of the batter into the pan, spread it out, and scatter the remaining streusel on the top. Bake for 50 to 60 minutes until a toothpick inserted in the center comes out clean. Let the cake cool in the pan on a wire rack for at least 30 minutes. Carefully transfer the cake, streusel side up, onto a serving plate. Whisk the confectioners’ sugar and maple syrup together, adding a few drops of water if necessary, to make a glaze. Drizzle over the cake. Looking for a vegetarian entree that’s a little different, or a parve Chinese dish? 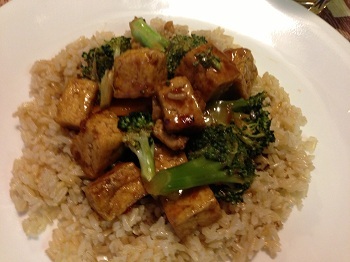 Try this Orange-Broccoli Tofu! This recipe was featured by Huffington Post as one of the dozen best vegetarian recipes of 2012. It was provided by Adeena Sussman for a website called Kitchen Daily (www.kitchendaily.com). The hardest part of the recipe is measuring out the ingredients – and getting the tofu dry enough that it doesn’t splatter when you brown it in oil. Drain it thoroughly, then squeeze it in paper towel as many times as necessary to draw the moisture out. You might want to use reduced-sodium soy sauce, because it’s rather salty. I added a little bit of colored pepper to the original recipe to give it color. This recipe would probably be good with chicken or beef too. In a bowl, whisk the cornstarch and the warm water. Add the orange juice and zest, soy sauce, rice vinegar and hot chili sauce and mix well. Reserve. Steam the broccoli for 3 to 4 minutes until it is bright green but still very firm. Remove from heat. Add the garlic and cook for 30 seconds. Add the broccoli and orange sauce and stir to combine. Cook until the sauce bubbles, thickens and reduces slightly – an additional 2 to 3 minutes. I offer this recipe in memory of my father-in-law, Theo Lewis, for whom this recipe is named. His yahrtzeit (death anniversary) is this week — maybe. I say maybe because it’s a leap year in the Jewish calendar, and so there are two months of Adar. There’s some question about whether the yahrtzeit should be observed in the first or the second. At our synagogue they read his name in the list of memorials this week, but my husband says he’ll light his yahrtzeit candle in the second Adar. Theo and his wife Betty were vegetarians, but Theo — who did all the cooking in the household — cooked many a meat meal for his omnivore children. He usually fixed chicken this way. The ingredients may sound weird, but trust me, this is an easy and delicious way to make chicken! Wash the chicken pieces and pat them dry. 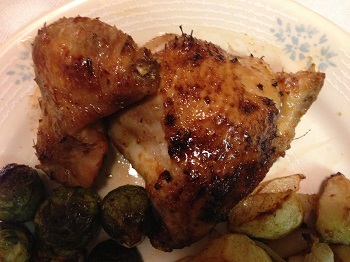 Spray a roasting or baking pan with cooking spray and place the chicken in the pan, skin side up. Sprinkle lightly with garlic powder. Rub brown sugar into the chicken pieces. Sprinkle the orange zest over the chicken, and then pour the lemon juice over. Bake for about an hour, basting frequently, until the chicken is nicely browned.